Nephila clavipes juveniles (Banana Spider). A baby banana spider (aka Golden Orb Weaver). This species makes its home in the southeastern US and is--despite the large size of the adult females (2" without legs)--fairly harmless (but bites might trigger allergic reactions). I found this little specimen near our house wall sharing a web with an Orchard Orbweaver. 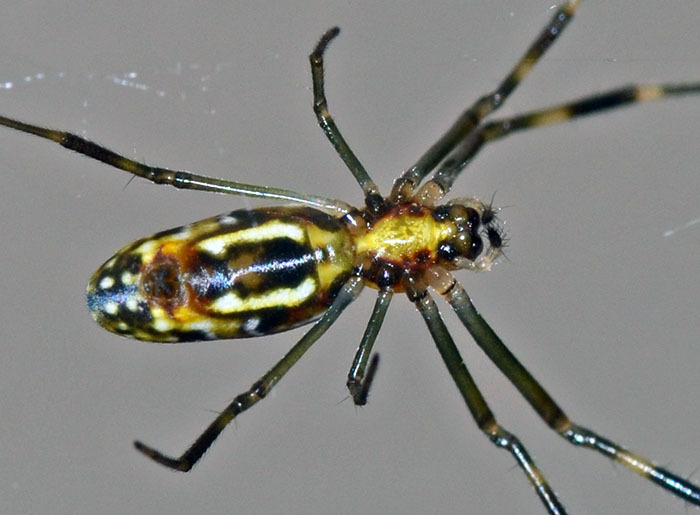 Young banana spiders do not build the characteristic yellow-colored webs. Their webs are vertical, elliptical orbs that lack the portion of the orb over the center. 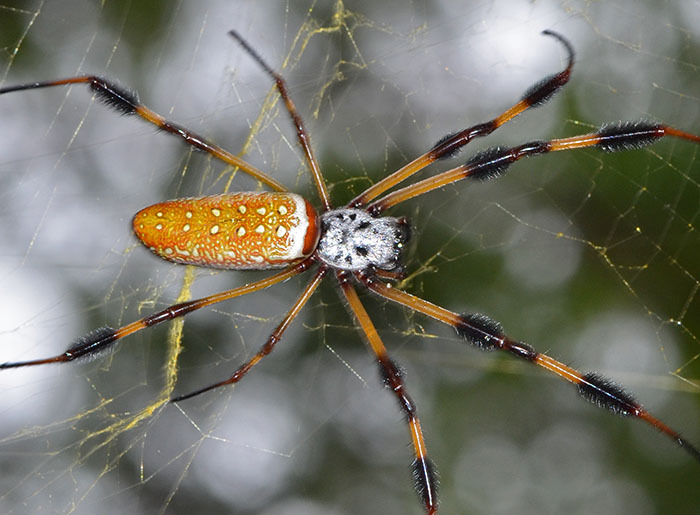 Nephila clavipes (Golden Silk Orbweaver). Finally a good photo of a grown-up banana spider. I found this specimen on the day of hurricane Irma's landfall in Florida. It had built a huge, yellowish web spanning at least four feet on the north-side of our house. I wonder how it'll do while Irma passes Tallahassee. Everyone is nervous here to say the least. By the way, people have made clothes from the spider silk. At the World Fair of 1900, there were two bed hangings on display and in the early 2000s Nicholas Godley collected the silk of 1.2 million Golden silk orb-weavers to produce a shawl. The anchor silk has a tensile strength that exceeds that of steel by a factor of eight.